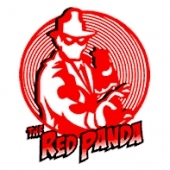 Red Panda: Dead or Alive! Someone is on a spree of high-profile robberies throughout the city. Someone wearing a very familiar bright red mask! Can it be true? Has the city's champion turned traitor to the cause of law and order? Can even Kit Baxter, The Flying Squirrel save her friend and mentor once the call has gone out - Red Panda: Dead Or Alive!